Install data loggers. iButtons from Dallas Semiconductor can record temperatures for up to a year inside your building. Hobos from Onset Computers not only record temperatures, but light, relative humidity and amperage. Data from these loggers can show you if you are using energy when the buildings are actually occupied. Visit your building at 3am. Early morning visits, when no one is supposed to be in your building, can reveal many interesting ways to reduce energy use. Space temperatures may be unnecessarily warm, or lights may have been left on by mistake. Sounds, sights and smells can tell you how to reduce overnight energy use. Visit other religious buildings knowing their consumption. If you know that a similar building uses less fuel and electricity than yours does, you can learn a lot by visiting with the people who operate it. Such visits without utility data in hand, however, are not valuable. Log onto web sites. We have listed many energy websites in past newsletters. Check them out. 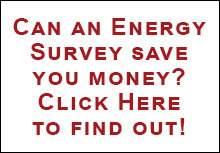 Hire an energy consultant. If you want help with the above, or just plan run out of energy to enliven your energy management programs, call ICE at 215-635-1122. We can help get you going again.